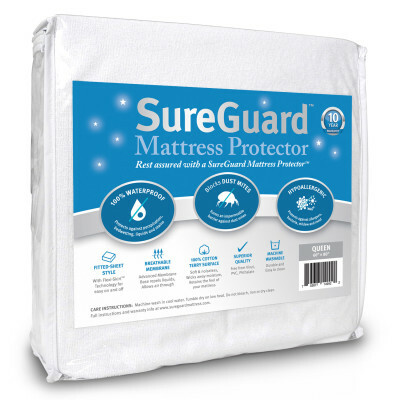 When it comes to superior, reliable mattress protection, SureGuard has you covered. Mini Crib: 27″ x 39″ – ideal for Pack n Play and other portable crib mattresses. Crib: 28″ x 52″ – stretches to 6″ deep. Twin XL: 39″ x 80″ – buy 2 for a Split King. 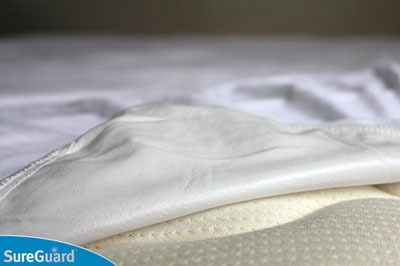 SureGuard Mattress Protectors provide top protection against perspiration, bed wetting, liquids and stains – protecting your mattress and its warranty. The unique base creates an impermeable barrier against common allergens, like dust mites, pollen, pet dander, mold and mildew. Never has it been easier to get night-time allergy relief! With its 100% cotton terry surface, the SureGuard Mattress Protector provides a soft comfortable sleep space, without changing the feel of your mattress. The fitted sheet style with Flexi-Skirt technology makes it a snap to protect just about any depth mattress. To use, simply fit the protector over your mattress, and place a tight fitted sheet on top. Watch and learn. 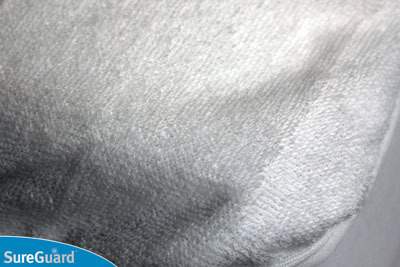 The advanced breathable membrane base blocks liquids, while still allowing air to flow through. This keeps your bed cool and dry throughout the night. The protector is perfect for memory foam mattresses, where it allows your body heat to flow through, and activate the foam’s contouring properties. NOTE: If you have a heated mattress pad on the bed, it is better to place the protector UNDER the pad. If the protector is placed OVER the pad, the high direct heat may damage the waterproof backing. Each waterproof mattress cover is made with the finest materials and put through rigorous quality checks to ensure it remains durable and protects your mattress, wash after wash. For best results, follow the care instructions. SureGuard Mattress Protectors contain no Vinyl, PVC, Phthalates or fire retardants, making our products breathable, odorless and free from harsh chemicals. When you buy a SureGuard Mattress Protector, you have a full 30 days to try it out risk-free. If the product does not live up to your expectations, you can return it for a full refund (less shipping costs). In addition, all SureGuard protectors come with a 1o-year full replacement warranty. 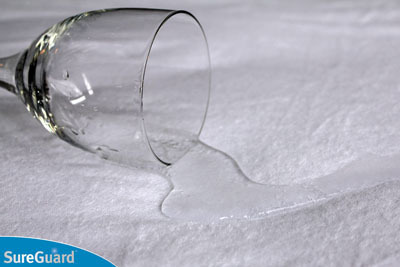 Rest Assured with a SureGuard Mattress Protector.